University of Washington scientists are part of an international team that is spending six weeks in the remote Southern Ocean to tackle one of the region’s many mysteries: its clouds. What they discover will be used to improve climate models, which routinely underestimate how much solar energy bounces off clouds in that region. Simulating how much solar energy is absorbed or reflected on Earth is key to calculating the future of the planet under climate change. The Southern Ocean Clouds, Radiation, Aerosol Transport Experimental Study, or SOCRATES, could also help scientists understand the very nature of how clouds interact with aerosols — natural or human-made particles that are suspended in the atmosphere. Aerosols can cause clouds to form, change their structure and affect precipitation, all of which affect the amount of energy that reaches the surface. Roger Marchand with UW students Litai Kang (left) and Emily Tansey (center) in front of the Hiaper research aircraft. During the mission, which runs from mid-January through Feb. 25, the scientists are collecting data from air and sea. 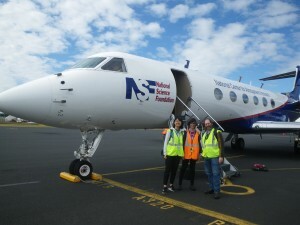 Observations are being taken from the High-performance Instrumented Airborne Platform for Environmental Research, or HIAPER, a highly modified aircraft operated by the NSF and the National Center for Atmospheric Research, and the R/V Investigator, an Australian deep-ocean research vessel. 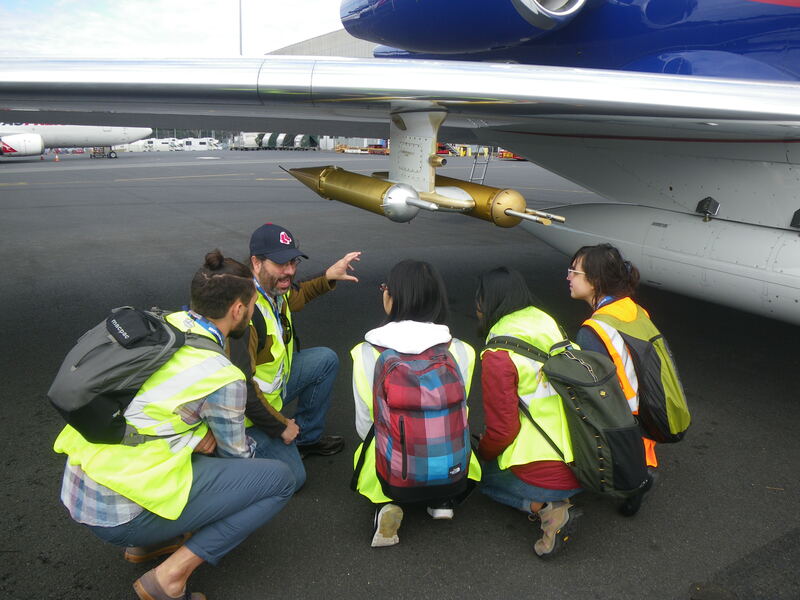 Roger Marchand (wearing hat) and graduate students from the UW and Monash University discuss research aircraft instrumentation. The research aircraft based out of Hobart, Tasmania, will make about 16 flights over the Southern Ocean. Instruments will measure the size and distribution of cloud droplets, ice crystals and aerosols. The data will help test the theory that climate models may not be producing enough supercooled water — droplets that stay liquid even when the temperature is below freezing. Measurements will also provide a look back in time to see how the atmosphere behaved in a time when it contained fewer human pollutants. 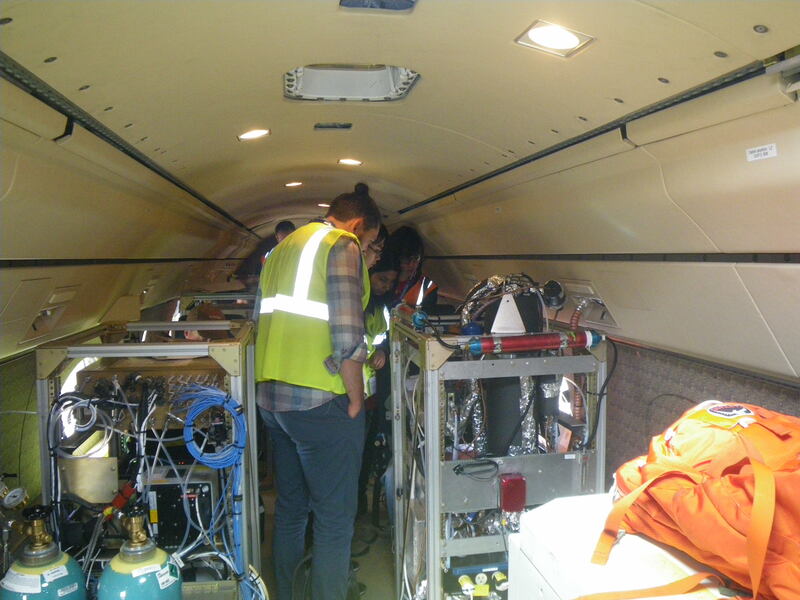 Equipment inside the aircraft will help measure the properties of the clouds and aerosols outside. The measurements taken from the sky will be complemented by data collected from the R/V Investigator. The ship’s team will launch soundings every six hours, and sometimes more often, throughout the campaign. 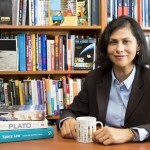 The U.S. portion of SOCRATES is largely funded by the National Science Foundation. 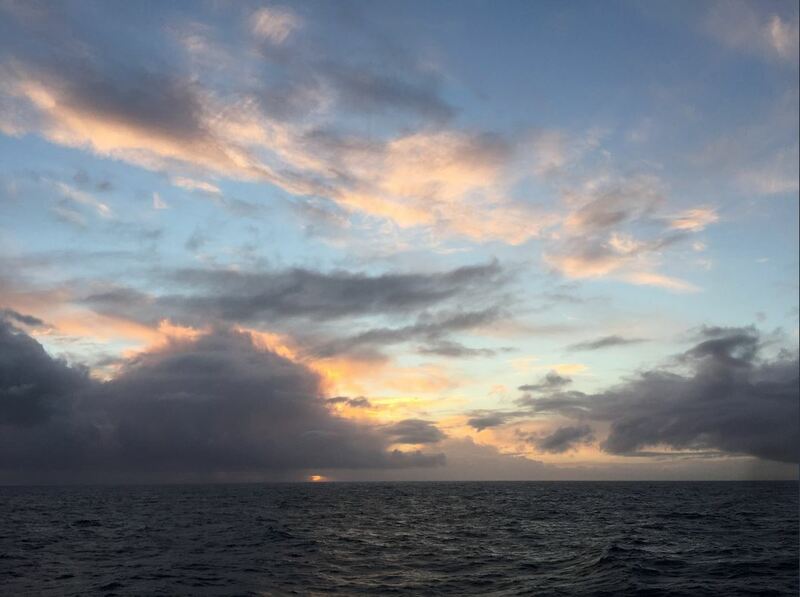 “The Southern Ocean is famously remote and stormy and it’s hard to imagine a worse place to do a field campaign. But a vast, stormy ocean is a great laboratory for studying clouds, and it’s clear from our models that we have a lot to learn about them,” said Eric DeWeaver, program director in NSF’s geoscience directorate. SOCRATES investigators will also incorporate other ocean measurements and data from land-based instruments on Macquarie Island that UW scientists installed in 2016. Based on a National Center for Atmospheric Research press release. 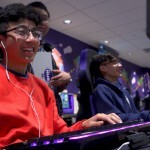 For more information, contact Marchand at rojmarch@uw.edu.